As more and more early childhood settings implement inclusive practices, teachers need to blend special and general education techniques to help all children learn. 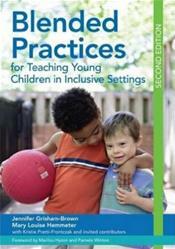 They'll find out how with the new edition of this bestselling text, which combines today's best practices for teaching young children with and without disabilities into one comprehensive approach. Ideal for current and future early childhood educators working with children from ages 2 to 5, this comprehensive text provides explicit guidance on developing a successful curriculum framework, working effectively with families and other team members, tailoring instruction to each child's individual needs, and embedding learning opportunities that address all children's goals. Teachers will learn from the field's most current research, and they'll get a full continuum of strategies for teaching young children with diverse abilities. Practical information on authentic assessment and data-driven decision-making is also woven throughout the book. An essential reference to keep and use for years to come, this book is every early childhood educator's guide to blending the best of special and general education, developing effective curricula, and improving outcomes for all children.